Tomorrow's "civil forum" at California's Saddleback Church won't just be the first joint appearance of the 2008 campaign for Barack Obama and John McCain. It will also be a key moment in the evangelical community's effort to define itself - and its role in politics - in the post George W. Bush era. The founding pastor of the 23,000-member Saddleback Church is "Purpose-Driven Life" author Rick Warren. Perhaps the most prominent so-called "new evangelical" in the country, Warren focuses more on issues like AIDS, poverty, human rights and the environment than on social issues, chief among them abortion and gay marriage, that have been the focus of traditional evangelicals in recent years. And the fact that Obama and McCain have chosen to reach out to evangelicals via Warren - who speaks of uniting ideological opposites and has declined to back either candidate - has not gone unnoticed. After all, it was just four years ago that Mr. Bush won reelection in part by driving up turnout amongst evangelicals who seemed to be galvanized by his rhetoric on social issues. "Warren is the guy now," said Steven Waldman, editor-in-chief of Beliefnet.com. "He's the leading evangelical figure. He's trying to craft a new direction, a new image for evangelicals. The fact that this is happening at Saddleback, not Focus on the Family, makes it more neutral ground. It's an audience that both Obama and McCain have a real shot at getting." Hours before Obama and McCain take the stage at Saddleback, however, a very different evangelical gathering will be taking place at the National Mall. There, according to Lou Engle, founder of TheCall, thousands of evangelicals will gather for "cross-denominational solemn assembly" to pray and push evangelicals to keep marriage and abortion front and center in their minds. Engle says his effort, which has the support of former Arkansas Governor and presidential candidate Mike Huckabee, Family Research Council President Tony Perkins and other prominent religious figures, was not designed to counter Warren's forum. (He says it was planned long before Warren's event was announced.) But he adds that new evangelicals like Warren tend to "take up the causes that are politically correct, and don't want to take up issues that are controversial." "We're not at war with Rick Warren," Engle said. "We thank God for his emphasis. But it's interesting that [the candidates are] going to a voice that has been somewhat silent on the great foundational issues of abortion and marriage, even though he would stand for those." Engle said he is concerned about the future of the evangelical movement, since "there aren't clear voices delineating truth." He insisted that marriage and abortion have to remain at the center of the movement, or "we are in danger of losing this whole country to the secularism of Europe." Huckabee, who calls Warren a "close personal friend" and compares him to Billy Graham, said he signed onto Engle's effort because it represents an effort to "call upon believers" to affirm a pro-life position, which he calls a "non-partisan issue." "I don't see any conflict at all, and if there was I wouldn't be a part of it," Huckabee said. "I'm focused on the same thing Rick Warren is focused on. I think evangelicals must be talking about disease and poverty." Perkins of the Family Research Council, a traditional evangelical, said he expects Warren not to ignore the issues that Engle is spotlighting. "I believe that Pastor Rick is going to ask a wide range of questions, and I believe he will ask questions about issues of life, efforts to redefine marriage, the importance of family, and other issues that are of concern to traditional evangelicals," said Perkins. "I don't know how hard he will press - it's sort of a new role for him," Perkins added. On CBS' The Early Show this morning, Warren said he would ask the candidates about "questions of political stewardship," "leadership questions," "worldview issues," and America's role overseas. It was in the "worldview issues" portion of the forum, he said, where candidates would be asked the "minefield" questions where "no matter what you answer, somebody's going to disagree with you." "It's going to be a pretty well-rounded conversation," Warren said. He argued that "there are a lot of Americans who feel disaffected by both the left and the right" and who agree with some issues on both sides of the traditional political divide. In 2004, Warren flirted with "using his influence to become the next Jerry Falwell or James Dobson," as Time put it, informally backing Mr. Bush and emphasizing issues like abortion and stem-cell research in an email to several thousand pastors. He says he shifted to a focus on issues like poverty after hearing a message from God. Because of Warren's outsize influence, that shift could have crucial implications for the presidential race. "The fight all comes down to abortion and gays," Waldman said. "If you don't just focus on those two issues, if you say there are a variety of issues that ought to be of concern to evangelicals, you can plausibly see evangelicals saying Obama is better on the first three, McCain is better on the last two." According to Waldman, about 40 percent of evangelicals now describe themselves as moderate or liberal. Some estimates put the U.S. evangelical population close to 100 million. "McCain and the Republicans need to have evangelicals vote mostly on social issues," he said. "If they do that, they'll vote McCain. Obama is a very strong candidate to appeal to moderate evangelicals. He talks about his faith in a compelling way and appeals to them on poverty, the environment, and the desire for change." Though McCain has never been a favorite of social conservatives, he has long been staunchly pro-life, and would benefit if evangelicals focus more on abortion than some of the other issues Warren will likely spotlight tomorrow. 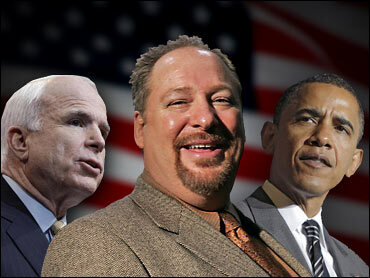 Engle has declined to endorse a candidate and says he has his reservations about McCain. But he saves his harshest rhetoric for Obama, whose beliefs, he said, "counter my convictions and the convictions of masses of believing Americans." "I think the church is in danger of a deception of being courted by Senator Obama," he said. "And they don't really know the truth."